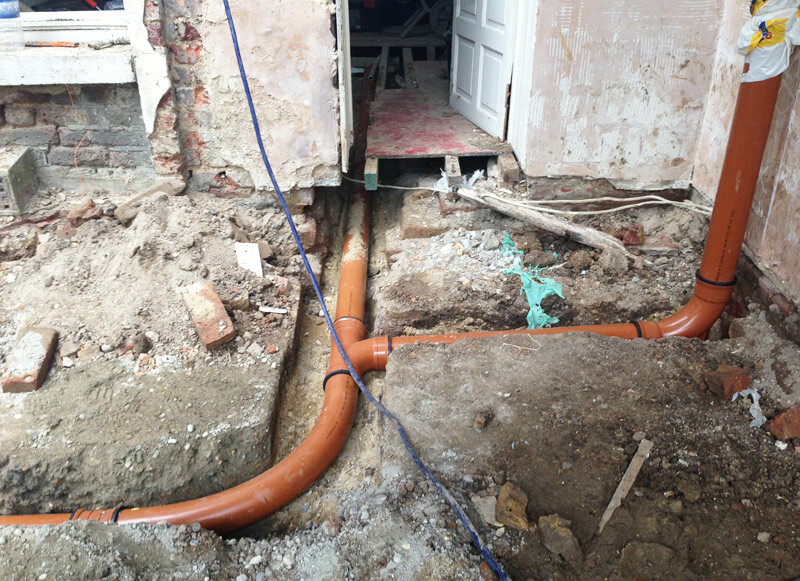 At Top Build UK we offer underground draining services for commercial and residential properties in London. We install underground drainage systems to eliminate moisture and dampness in the basement and to reduce erosion of the foundation. Excessive moisture leads to mildew and mold and often results in costly repairs. Our engineers will install downspouts, paying attention to the slope of your yard, the corners, and the type of roofing. They will fit downspouts that are of adequate size to handle heavy rainfall. After installation, we will test the underground drainage system in accordance with the Building Regulation (Approved Document H). We will fill all gullies with water and will put test bags or plugs into the ends of the pipes to test the system. We specialize in different types of underground drains, including mole drains, box drains, rubble drains, and pipe or tile drains. These drains don’t interfere with farm operations and help reduce water wastage. We will install golden brown pipes, and you will distinguish them easily from clay drains which are dark brown in color. We will make sure that you have easy access to the drainage system – for removal of debris, inspection, and maintenance. At Top Build UK we offer painting and decorating services for commercial and residential projects. We specialize in exterior and interior work, from scumbling and staining to glossing and colour matching. We offer a selection of services to our London-based customers. The list of services includes complete surface preparation, graining, commercial spray painting, and painting on floors, wood, glass, and metal. We undertake industrial and commercial projects ranging from warehouses, production facilities, offices, and retail stores. Our range of services includes project management, fire retardant painting, spray painting, exterior and interior painting, and more. We undertake small and large scale domestic projects and offer services such as wallpaper hanging, pre-paint maintenance, exterior and interior decorating, and colour scheme consultations. We feature wallpapering, interior painting, coving, and plastering services. Whether you need French polishing, paint removal, or wallpaper removal, we will be able to help. We offer brush and spray applications, interior design and redesign services, and aluminum siding painting. We also feature specialty painting, kitchen cabinet painting, and ceiling spraying. Our team offers different spraying solutions to residential and commercial customers, from surfaces fire protection spraying to retail spaces spraying and cladding spraying. We offer fibre glass roofing installation for porches, sheds, outdoor patios, historic buildings, and smaller structures. protection and comes in many designs and sizes. This material is cheaper than other roofing alternatives and lasts about 30 years. It is suitable for demanding environments and can withstand chemical exposure and hurricane winds. Fibre glass roofing is shatterproof and resistant to corrosion. It has a high resistance to solvents, alkalis, and acids and meets fire resistance requirements. We work with different weights and profiles. Profiles come in a range of colors, from colored opaque to opal translucent and ice clear. Our engineers install special profiles that increase spanning capacity. We will install the panels in four steps: trimming, bandaging, laminating, and top coating. Our engineers will clean all surfaces and will expose the roof joints. They will re-deck the area and will fix the pre-moulded fillets trims, flashing trims, and edging trims. The board joints will be reinforced as well. We will place the GRP membrane and will then apply the top coat.